Combine cream cheese and mayonnaise and mix well in a food processor or blender. Stir in the cooked bacon, green onion, dill weed and pepper. Cover and chill overnight. 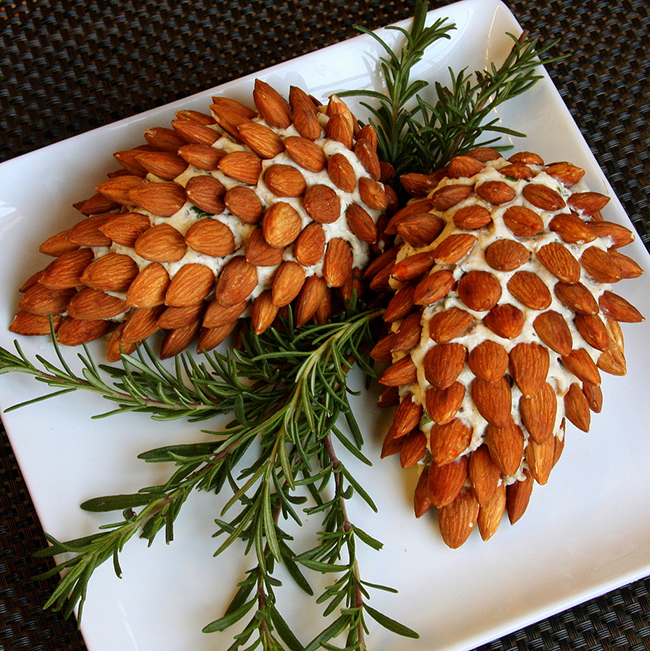 Shape the cheese mixture into two small pinecones on serving plate. Starting at the narrow end, place almonds into the cheese on a slight angle, forming rows. Garnish with rosemary twigs to resemble pine needles. Serve with crackers. Shop for Christmas theme paper goods and printables here. Or, check out more Christmas ideas on Pinterest or here on my blog! Um, yes, that looks amazing. And we do cranberry sauce with can lines, too! :) We're such cool people. hey now-that is waaaay too pretty to mess up Heather! i would have to have a security guard next to it and just have people stare at its beauty! so this is a definite must do. LOL! The recipe is no longer on active on the site. Can anyone post the recipe here? Or send it to me via Pinterest, please? That's weird, it was just there a couple days ago! I'll update the post with a cached copy of it. Totally want to do this for NYE. Could you recommend something other than mayo? Sour cream? Greek yogurt? Thanks. Been making this recipe for over 20 years...got it originally from Blue Diamond Nuts (I think). Everyone absolutely loves my "nut cheese" and I'm not allowed in the door at Christmas without it! What a fabulous idea! Easy way to make a big impression. How long does it take to get all the almonds on? I’m not sure if you want to know but there is an account, @mykitchendegree on instagram, that is using other people’s photos with no credit and acting like the photos are theirs. One of the photos is your pinecone cheeseball. Excited to get this blog!